Probably: Lionel Hampton (voc, dm, voc, ldr), Wendell Culley, Duke Garrette, Teddy Buckner, Leo Shepherd, Walter Williams (or possibly Snooky Young on some tracks) (tp), James Robinson, Andrew Penn, Jimmy Wormick, Britt Woodman (tb), Jack Kelso(n) (cl, as), Bobby Plater, Ben Kynard (as), Morris Lane, John Sparrow (ts), Charles Fowlkes (bar), Milt Buckner (p), Charles Mingus, (Joe Comfort or Charles Harris may be present) (b) Earl Walker (dm). The Hamptones: Herman McCoy, Wini Brown and Roland Burton (voc). Air checks, Meadowbrooks, Hollywood, November 1947. Airchecks, Fairmont, West Virginia, June 29, 1948. 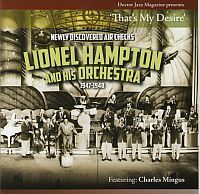 The Dutch jazz magazine Doctor Jazz Magazine is very proud to present this CD with newly discovered air checks of the Lionel Hampton Orchestra playing live in The Meadowbrook Gardens in Culver City LA, November 1947. In this period the band was musically very creative and a tight musical aggregation. The Hampton band was one of the top jazz bands in business. In this version we hear a young Charles Mingus performing his ‘Mingus Fingers’. We don’t know who recorded these acetates, but our ‘recording man’ was very active at that time (1947-1948). He recorded a lot from the radio and may have had some other sources where he could dub then rare recordings. In 2013 a building contractor worked on an old abandoned Hollywood house in the Hollywood Hills and discovered a storage area that was walled off and filled with several wrapped boxes of acetate records. Among them these Hampton acetates. They are now carefully restored by Harry Coster and released for the first time. The CD contains a booklet of 32 pages including photo’s and a discography.